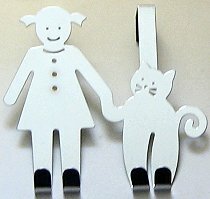 A little girl and a cat are holding hands on this hanger that fits over the top of a door. This chrome door hook is 8 1/2" high x 8 3/4" wide. Two hooks at the top will fit a door that is 1 3/8" thick. The feet of the girl and the cat are four hooks to hang toys or clothes. Previously owned but in good condition. 1 only.